Late last year, Beth from Sew DIY and I had the great idea of doing a little pattern swap. We had been swooning over each others patterns on Instagram, so thought it was about time we did something about it. Beth has a couple of patterns to choose from in her shop, but after a little deliberation, I decided to go with the Lou Box Top as I noticed there was a bit of a gap in my wardrobe for nice easy basics that I can wear to work, and thought that I could use the Lou Box to fill the gap. I love to use stash fabric, whenever possible, so decided to use some left over cotton linen that I had bought from The Fabric Store for a dress I had made for a friend at the beginning of the summer. What I liked straight away about the Lou Box, when I opened the pattern file, was all the options. There are two neckline options (a crew neck and a scoop neck) and three hem options (straight, dip or curved) and can be made in woven or knit (or a combination of the two). I couldn't make up my mind between the straight hem and the dipped hem, but thought I could go ahead and make the dipped hem, and if I didn't like it, I could just cut the hem straight once the top was assembled. I ended up printing and cutting all the options available in the pattern, so that I have them ready to go for next time (and there will definitely be a next time). When I got to laying the pattern on the fabric, ready for cutting, I realised there wasn't going to be enough meterage. I already had my heart set on the fabric, so decided to add a horizontal panel line on both the front and back. This was a super easy alteration to make as the pattern is actually made up of seperate panels, for each hemline option (the pattern pieces are just stuck together before the fabric is cut). So I just added seam allowance to the bottom of the body of the top and then seam allowance on the top of the hem panel. I actually really like this detail, and am considering doing the same thing next time, but using contrasting fabrics. I also detoured from the instructions a little by turning the sleeve up to create a small cuff (rather than turning under, as the instructions suggested), to add another little detail. In terms of fabric, Beth suggests using 'Light-weight knit or woven fabric with lots of drape, such as crepe de chine, chiffon, georgette and jersey,' and I know my cotton linen choice is a little more on the structured side that these suggestions, so it's definitely a little boxier than some of the other versions I've seen. I was a little worried about my decision just to go with it, but now that its' finished, it's one of the things I like most about this top! I feel really comfortable in it, and cannot believe how many times I've reached for it since I made it. It really has filled a gap in my wardrobe! It was a super speedy make, which was a really nice change for me, because I have been working on samples for my next pattern, which generally take a while as I am really pedantic when I am sampling, so that nothing gets past without being resolved. Sewing someone else's pattern, gave me a chance to disconnect from work, and gave me a chance to really enjoy the process, without the stress that sits alongside working on one of my own patterns before it's released. It's also a good opportunity to see how other designers do things! 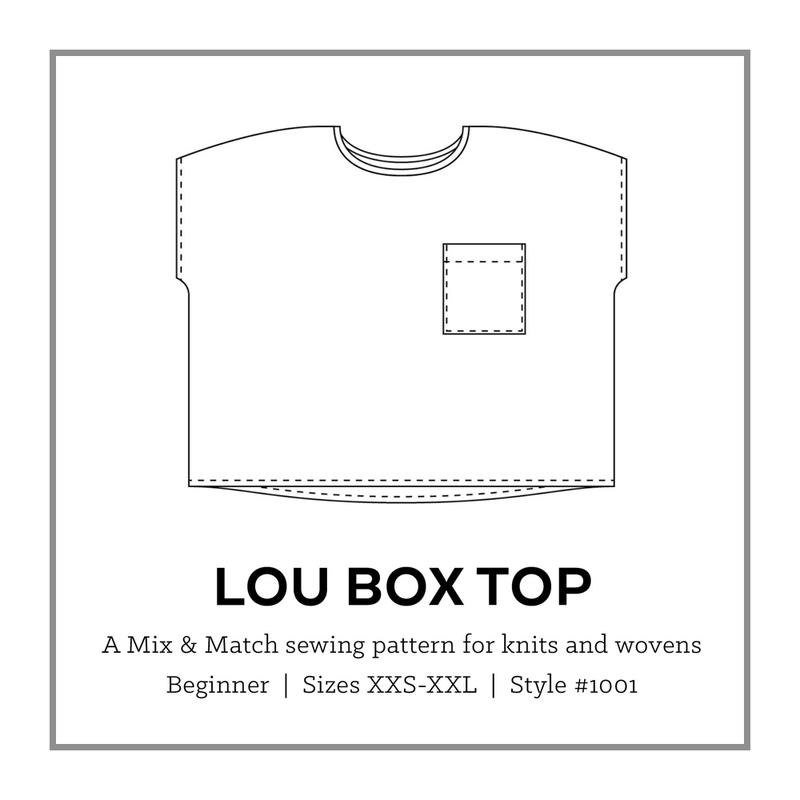 Well that's about all I can say about the Lou Box Top from Sew DIY. It's a perfect beginner pattern, but also a lovely speedy sew for the more experienced - providing lots of opportunity for variation. Thank you so much Beth for offering to trade patterns with me. I had a lot of fun! Beth made a really beautiful Ruschutter, so you should definitely go check out her post. Posted on January 26, 2016 by Emily Hundt and filed under sewing patterns, finished project and tagged finished project lou box top sew diy what I made.